So you want to share with others the world that has so entranced you? As a PADI 5-Star Facility, with our own on-site indoor heated pool and consistent training courses, we can bring anybody up to a leadership position efficiently. As a full-service training facility, we have a program that can take you to where you want to go. Whether it is a career as a dive professional or the desire to achieve a higher level certification to compliment another career, Deep Blue is there for you. We have a uniquely-qualified and trained staff teaching specialty courses, rebreathers, scuba instructor certifications and everything in between. The first step in your professional journey begins at Divemaster level. If you want to be there as people begin their Discover Scuba Diving experience for the first time or lead them through your favorite underwater exploration, this rating is for you. The stress of teaching an entire group belongs to the Open Water Scuba Diver Instructor, but as a Divemaster, you get to know all of the students, revel in the successes and help them through their struggles. As a PADI Divemaster, you can manage divers on a dive boat, lead divers at a resort, assist instructors, teach diving refreshers and even introduce non-divers to the underwater world during a Discover Scuba Diving course! Unlike most courses, the course’s schedule is rather flexible. In fact, other than a few set dates, you are the person that determines how long the course takes. Depending upon your schedule and availability, this course typically takes between 2 months and one year to complete. The price for the full, semi-private course is $825. The price covers course instruction, materials (crew pak, instructor manual w/binder, slates, Divemaster manual, Diving Knowledge workbook, and eRDPML), and pool time. Any additional boat tickets, rental gear, and Divemaster Application fees are not included. First Aid & CPR are skills that everybody needs. 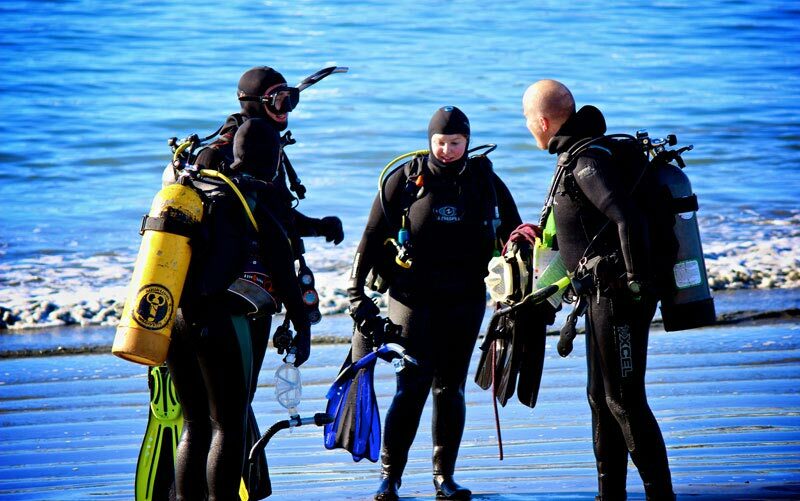 Whether you’re interested in teaching divers these skills or educators, clubs, churches or whomever, any Divemaster can become an Emergency First Responder Instructor. The course takes only a few nights and usually takes place during an Instructor Development Course so please let us know when you’re interested in taking this and we’ll let you know when it’s next taking place! The price of the course is $500 and includes your Emergency First Response Instructor Start-Up Pack. For those people interested in helping the Instructor out on classes more than they could as an Divemaster, you can become an Assistant Instructor. In order to start this course you must have already completed your Divemaster. Like Divemaster, this schedule is flexible. Come in for a meeting, go over schedules with the Course Director, lock in the dates and you’re good to go! The price of the course is $1325 and includes IDC Crew-Pak w/Guide to Teaching Manual. Spend your time getting paid to share that love of underwater exploration! The PADI Instructor Development Course covers both your EFR Instructor course and your Assistant Instructor course and by the end of it you’ll be qualified to send your own divers out into the world! Whether you want to work at a dive shop/resort, teach friends and family, or work your way around the world, becoming an Instructor can help you achieve that. Like all of the professional courses, this schedule is determined by you, your classmates, and your Course Director. The price of the course is $2525 – covering EFR Instructor, AI Instructor, and the IDC. The Instructor Exam, other PADI fees, and any boat tickets needed are not included.